The Tomahawk missile program—known as "the world’s most advanced cruise missile"—is set to be cut by $128 million under Obama’s fiscal year 2015 budget proposal and completely eliminated by fiscal year 2016, according to budget documents released by the Navy. "The administration’s proposed budget dramatically under-resources our investments in munitions and leaves the Defense Department with dangerous gaps in key areas, like Tomahawk and Hellfire missiles," said Rep. Randy Forbes (R., Va.), a member of House Armed Services Committee. "Increasing our investment in munitions and retaining our technological edge in research and development should be a key component of any serious defense strategy," he said. The U.S. Navy relied heavily on them during the 2011 military incursion into Libya, where some 220 Tomahawks were used during the fight. "It doesn’t make sense," said Seth Cropsey, director of the Hudson Institute’s Center for American Seapower. "This really moves the U.S. away from a position of influence and military dominance." Cropsey said that if someone were trying to "reduce the U.S. ability to shape events" in the world, "they couldn’t find a better way than depriving the U.S. fleet of Tomahawks. It’s breathtaking." The Navy has used various incarnations of the Tomahawk with great success over the past 30 years, employing them during Desert Storm and its battle zones from Iraq and Afghanistan to the Balkans. While the military as a whole is seeing its budgets reduced and equipment scaled back, the Tomahawk cuts do not appear to be due to a lack of funds. The administration seems to be taking the millions typically spent on the Tomahawk program and investing it in an experimental missile program that experts say will not be battle ready for at least 10 years. "It is definitely short-sighted given the value of the Tomahawk as a workhorse," said Mackenzie Eaglen, a former Pentagon staffer who analyzes military readiness. "The opening days of the U.S. lead-from-behind, ‘no-fly zone’ operation over Libya showcased how important this inventory of weapons is still today." Overall, the Navy has essentially cut in half its weapons procurement plan, impacting a wide range of tactical weapons and missiles. 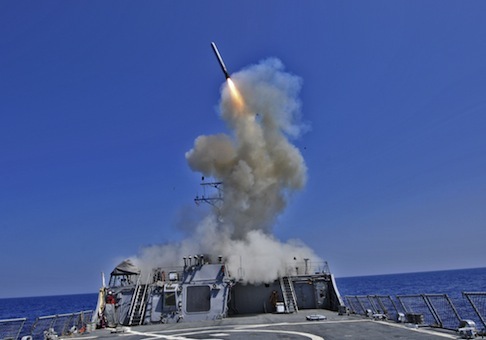 Navy experts and retired officials fear that the elimination of the Tomahawk and Hellfire systems—and the lack of a battle-ready replacement—will jeopardize the U.S. Navy’s supremacy as it faces increasingly advanced militaries from North Korea to the Middle East. The cuts are "like running a white flag up on a very tall flag pole and saying, ‘We are ready to be walked on,’" Cropsey said. Retired Army Lt. Col. Steve Russell called the cuts to the Tomahawk program devastating for multiple reasons. "We run a huge risk because so much of our national policy for immediate response is contingent on our national security team threatening with Tomahawk missiles," said Russell, who is currently running for Congress. "The very instrument we will often use and cite, we’re now cutting the program," Russell said. "There was a finite number [of Tomahawk’s] made and they’re not being replenished." "If our national policy is contingent on an immediate response with these missile and we’re not replacing them, then what are we going do?" Russell asked. North Korea, for instance, has successfully tested multi-stage rockets and other ballistic missiles in recent months. Experts say this is a sign that the Navy’s defensive capabilities will become all the more important in the Pacific in the years to come. Meanwhile, the experimental anti-ship cruise missile meant to replace the Tomahawk program will not be battle ready for at least 10 years, according to some experts. The Long Range Anti Ship Missile has suffered from extremely expensive development costs and has underperformed when tested. "You have to ask yourself: An anti-ship missile is not going to be something we can drive into a cave in Tora Bora," Russell said. "To replace it with something not needed as badly, and invest in something not even capable of passing basic tests, that causes real concern." The Pentagon did not return requests for comment.